Scorpion Pose is not a posture you see everyday! Some of the more difficult poses in yoga are seen by onlookers as very weird yoga positions. While a lot of yoga poses may seem to have odd names, there are some poses that beginning yogis see for the first time and wonder how anyone ever got into that pose. While they may look difficult and downright weird, advanced yoga poses offer multiple health benefits and often help one develop superior balancing skills. Whether you want to master these poses for a good challenge or because they are beneficial yoga poses, you will probably enjoy the extra challenge. Contortionists and gymnasts can do many of the weird yoga positions mentioned below without any special training in yoga. For yogis, it's best to try these poses under the supervision of a good instructor. Working your way up to these yoga poses over time is the best way to prepare. Scorpion Pose is so named because if the yogi stops in the middle of the pose, the whole human silhouette looks very much like a scorpion dancing. A handstand pose, this pose requires arm strength, good balance and stability, and flexibility in the back, which is enabled by a strong core. This pose, pictured at the top of this page, is an easier handstand than others. In Scorpion, the entire lower arm is on the ground supporting your body. The most difficult aspect of this pose is controlling your body to curve your back and bring your legs around in the opposite direction. For outsiders, this pose looks extremely difficult, but done with a yoga instructor by an advanced yoga student, this pose is not difficult and offers significant benefits for the core, for arm strength and for overall balance. To non-yogis, Side Crow Pose often looks like a hip-hop dance move or a breakdancer caught in mid-spin. This pose is also a handstand, meaning that it requires arm and core strength. With arms bent at a 90-degree angle and all your body weight supported by your hands, your body is sideways above your bent arms. Variations of this pose include simply keeping both legs bent and close to the body in midair, or more advanced versions straighten one or both legs. The basic Side Crow looks strange enough to onlookers, but the extended legs and legs folded one over the other looks even more difficult and like a contortion artist's trick. Yet another suspended pose is the Flying Crow Pose. This pose looks somewhat like Pigeon Yoga Pose, on the floor with one foot tucked under your middle body and the other leg extended behind you. This is modified into Flying Crow by placing your body in mid-air, suspended on your hands, arms bent 90 degrees. The foot that would be tucked under your body in regular crow pose is now tucked between your body and the crook in your arms, and the extended leg extends out in mid-air. This pose is difficult because of having to hold your body's weight off the ground. Another excellent balance and strength pose, Flying Crow is a pose to attempt only after considerable yoga experience. King Pigeon, unlike the other weird poses named here, is not a handstand pose. This pose starts seated on the ground, with one leg bent horizontally in front of you, and the other leg bent vertically (upper leg on the ground, bent knee with lower leg coming up in the air) so that your foot comes up behind you. Bending your back towards your raised foot, extend your arms overhead with elbows pointing straight up and hands coming to meet your raised foot and your head--your foot, hands, and head should come together in one point. Repeat this one with the opposite leg for balanced benefits. While these weird yoga positions may look strange to others, these poses are excellent yoga positions for balance, flexibility, and whole-body conditioning. 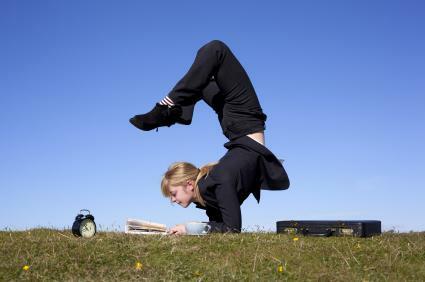 Visit Yoga Journal for more performance guidelines and pictures of these postures.